Leading Manufacturer of leather carpet collections, leather carpet collection, leather carpet collection - black & white and patched leather carpet from Panipat. We enjoy an expertise in providing a range of high quality Lather Carpet Collection at a competitive rate to our clients. 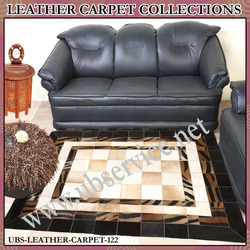 This highly acclaimed Leather Carpet Collection is procured from our trusted vendors and is 100% leather in quality. Available in large rectangular shape, this carpet is perfect in enhancing the decor of the room. We are engaged in the supply of a range of high quality leather carpet collections to our esteemed clients. We obtain this designed carpet collection from our reliable vendors. This carpet collection is large in size and made of 100% leather. Available at competitive rate, this carpet collection aids in adding elegance to your room. We offer a range of supreme quality leather carpet collection – black & white to our esteemed clients at an affordable price. This carpet collection is appreciated for its quality texture is procured from reliable sources. The material used in the making of the carpet is 100% leather. 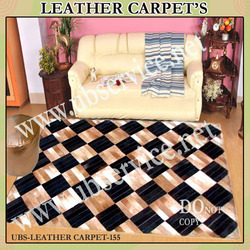 Available in large size, this leather carpet almost covers the sitting area of your room.